How to best care for your trees, shrubs, and other greenery. 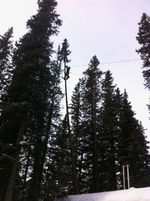 Learn from our tree care specialists serving Invermere and Golden, BC. speedline removalGreen Leaf was recently commissioned by Canadian Rocky Mountain Resorts to remove an uprooted spruce tree with extensive decay which threatened to fall onto a propane tank and delivery system. With no room below the tree to place any pieces our skilled climber employed a speedline rigging system to safely lower all limbs and wood to a landing zone away from the propane tank. Technical removals like this are our specialty! We are trained and certified to deal with such hazards in confined spaces. Green Leaf Tree Services is a small family run business located in the Columbia Valley. We are trained and certified arborists who pride ourselves on providing the best possible care for our clients trees and properties. Sign up with your name and email address to receive our news and updates. We respect your privacy. We will never share, rent or sell your information. Job Opportunities | Links | Contact Us | 2018 (c) Green Leaf Tree Services Inc. All Rights Reserved.